After the huge success with Harvest, a marathon tour was booked for Neil Young. He was playing for bigger audiences than ever before, but the result was not fully convincing with Young somewhat misplaced as a stadium performer. 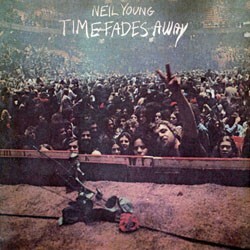 Eight songs from mostly different concerts were placed on Times Fade Away that was released in August 1973. The most interesting aspect of the Time Fades Away album is the fact that the material was so far unreleased. With a full band on stage and an enormous audience to feed the sound was different. The mellow country and sweet harmonies were no longer present in many songs. The personnel were the same – except some changes through the tour – as in the Harvest recordings. The new style could for example be noticeable in a funky “Yonder Stands the Sinner” with Neil Young screaming out some of the lines. Times Fades Away lacks homogeneity as a mix of songs performed by a band and some solo songs. The audience probably recognizes the singer-song writer they got to knew best in “Journey Through the Past”, “Love In Mind” and “The Bridge” that is done with Neil sitting by the piano. Neil Young himself was unsatisfied with the tour and also the album that he refers to as “the worst record I ever made” in an interview from 1987. Concerning live albums with Young better choices than Times Fade Away can be found in, for example, Live at the Fillmore East, Live at Massey Hall and Unplugged which all manifesting the intimacy in his music.